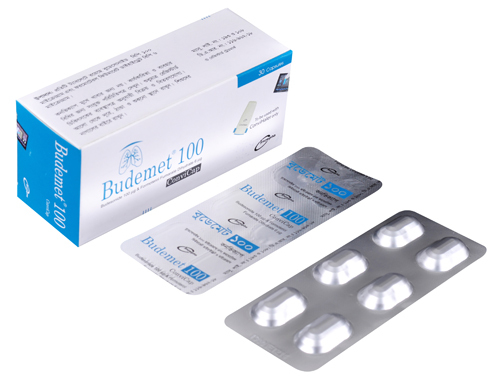 Budemet 100 Convicap: Each capsule contains Budesonide BP 100 µg and Formoterol Fumarate Dihydrate BP 6 µg inhalation powder. 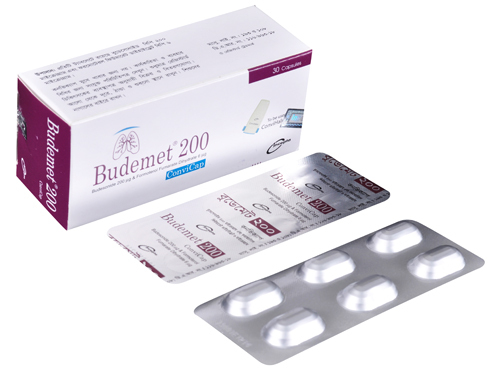 Budemet 200 Convicap: Each capsule contains Budesonide BP 200 µg and Formoterol Fumarate Dihydrate BP 6 µg inhalation powder. 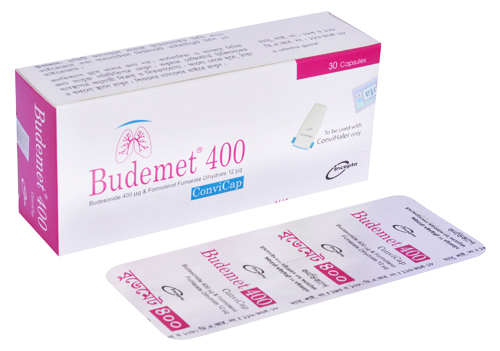 Budemet 400 Convicap: Each capsule contains Budesonide BP 400 µg and Formoterol Fumarate Dihydrate BP 12 µg inhalation powder. Budesonide and Formoterol have different mode of action and show additive effects in terms of reduction of asthma exacerbations. The specific properties of Budesonide and Formoterol allow the combination to be used both as maintenance and reliever therapy, and as maintenance treatment for asthma. Budesonide is a glucocorticosteroid which when inhaled has a rapid (within hours) and dose dependent anti-inflammatory action in the airways, resulting in reduced symptoms and fewer asthma exacerbations. Formoterol Fumarate Dihydrate is a long acting β2-adrenoreceptor agonist having rapid onset of action. -patients who are not adequately controlled with inhaled corticosteroid therapy and as needed inhaled --short-acting β2-adrenoceptor agonists. -patients who are already adequately controlled on regular separate long-acting β2-agonist and inhaled corticosteroid therapies. Budesonide and Formoterol combination is indicated in the regular treatment of adult patients with moderate to severe chronic obstructive pulmonary disease (COPD) with frequent symptoms despite β2-agonist use and a history of exacerbations. There are two alternative dosage regimens for the treatment of asthma with Budesonide and Formoterol combination. Reliever dose: 1 additional Convicap as needed in response to symptoms. If symptoms persist after a few minutes, an additional Convicap should be taken. Not more than 6 Convicaps should be taken on any single occasion. A total daily dose of more than 8 Convicaps is not normally needed, however a total daily dose of up to 12 Convicaps can be used temporarily. Maintenance dose: Budemet 100 Convicap once daily. Reliever dose: 1 additional Convicap as needed in response to symptoms. If symptoms persist after a few minutes, an additional Convicap should be taken. Not more than 4 Convicaps should be taken on any single occasion. A total daily dose of more than 4 Convicaps is not normally needed, however a total daily dose of up to 8 Convicaps could be used temporarily. Maximum daily maintenance dose: 4 Convicaps (2 Convicaps twice daily). Budemet 200 Convicap: 1-2 Convicaps once or twice daily. Maximum daily maintenance dose: 4 Convicaps. ( 2 Convicaps twice daily ). During worsening of asthma the dose of Budemet 100 Convicap and Budemet 200 Convicap may temporarily be increased to a maximum of 4 Convicaps twice daily in adults. Budemet 400 Convicap : 1 ConviCap once or twice daily. Maximum daily maintenance dose: 2 ConviCaps (1 ConviCap twice daily). During worsening of asthma the dose of Budemet 400 Convicap may temporarily be increased to a maximum of 2 Convicaps twice daily in adults. Budemet 200 Convicap: 1 Convicap twice daily. Maximum daily maintenance dose: 2 Convicaps. Budemet 200 Convicap: 2 Convicaps twice daily. Budemet 400 Convicap: 1 Convicap twice daily. Maximum daily maintenance dose: 2 Convicaps. The most common drug related adverse reactions are pharmacologically predictable side effects of β2-agonist therapy, such as tremor and palpitations. Adverse events which have been associated with Budesonide and Formoterol are Palpitations, Candida infections in oropharynx, Headache, Tremor, Coughing, Hoarseness and Tachycardia. Treatment with Budesonide and Formoterol combination should not be initiated to treat a severe exacerbation or if patients have significantly worsening or acutely deteriorating asthma. Pregnancy: Budesonide and Formoterol combination should only be used in pregnancy if the potential benefits outweigh the potential risks to the foetus. Lactation: Administration of Budesonide and Formoterol combination to women who are breastfeeding should only be considered if the expected benefit to the mother is greater than any possible risk to the child.